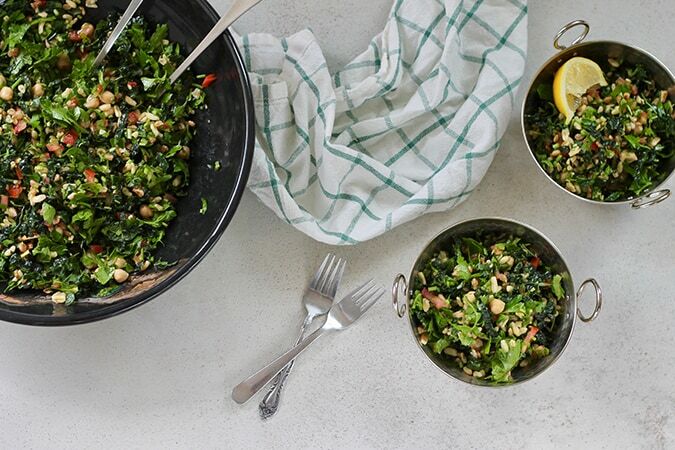 This Kale Tabbouleh Salad is a healthy riff on traditional tabbouleh, plumped up with kale, packed with protein thanks to chickpeas, and with toothsome kamut for a hearty and filling vegan salad that’s a meal in of itself. We spent this past weekend in Tuscany on a whirlwind trip to marry off a couple of our friends. And I do mean that literally – I officiated the wedding, which was hilarious and awesome and emotional and amazing. Every time one of my friends gets engaged I offer to officiate (like Joey did on Friends, duh) as a joke, but this is the first time anyone has taken me up on it. So I can add that to my list of random and awesome life accomplishments. It was a lovely weekend with a group of friends – old a new – staying together at an incredible villa in the Tuscan country side. We had a Tuscan wine tasting, several incredible family-style meals, and on the night of the wedding they lit up the wood-burning pizza oven and had an amazing cranky old Italian man slinging pies into the night. Really, it was the stuff that dreams are made of, and I only wish we could have stayed longer. I didn’t eat any Tuscan kale in Tuscany (but I made up for it in Tuscan wine, trust me), but I definitely came home with salad on the agenda after an indulgent and cheese-heavy carb-heavy weekend. 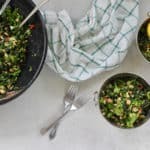 This kale tabbouleh salad – made with Lacinato (Tuscan) kale, is a pretty substantial departure from Italian food, I know, but one I think you’re going to enjoy. I spent many years of my life convinced that I didn’t like tabbouleh, and perhaps I didn’t, as taste buds tend to evolve over time. These days I’m a real parsley fiend, though; I’ll find pretty well any excuse to eat it. I wanted to put together a riff on tabbouleh that was a little more substantial and packed a little more punch nutritionally. Don’t get me wrong, parsley is amazing stuff on its own, but teamed up with kale, chickpeas, and kamut, this salad goes from pretty healthy to a super food extravaganza. I like the fact that the addition of kale doubles the greens and makes the salad a bit more robust than it would be otherwise. 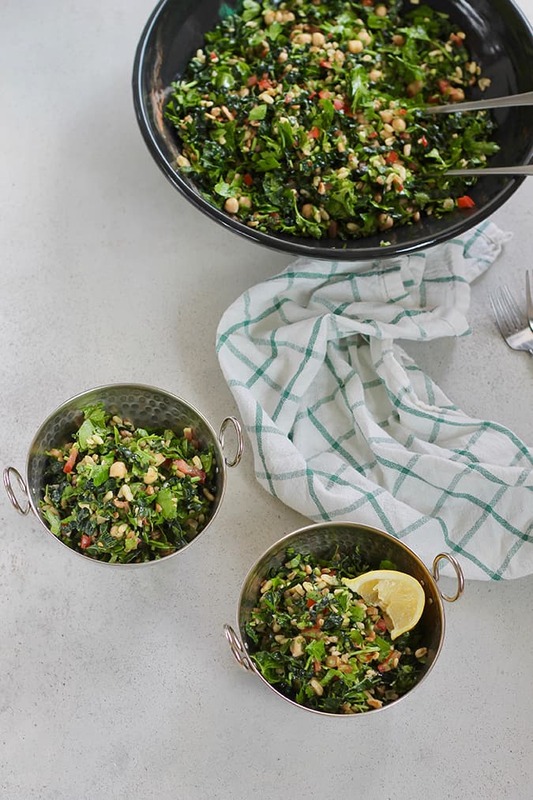 What’s in this Kale Tabbouleh Salad? 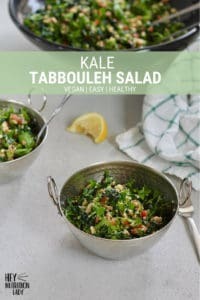 If kale tabbouleh salad sounds a tad untraditional to you, well hold onto your hats, because I also replaced the traditional bulgur wheat with kamut. To be perfectly honest, I had kamut in my pantry so it was a swap made out of laziness above all else. I do find, however, that bulgur is one of the few wheat products that upsets my stomach, and I love the toothsome chew of the kamut, and the nutty flavour it gets here from being toasted in olive oil. The chickpeas add satiating protein and take this from being a simple salad to a meal in a bowl. 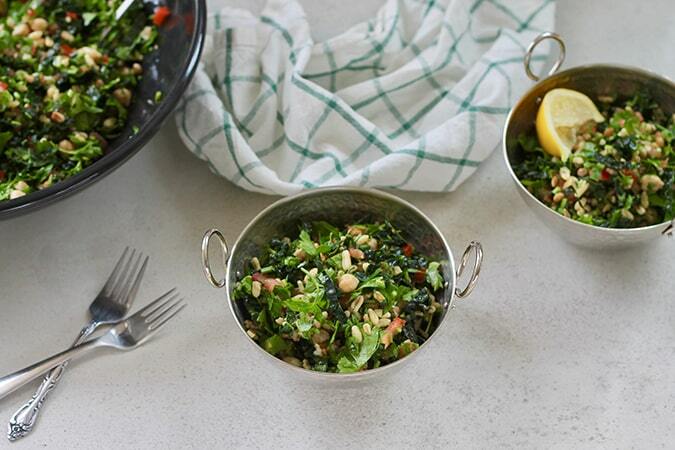 Kale Tabbouleh Salad – I think you’re gonna like it. Start with the freshest parsley and best tomatoes you can find – they really take the flavour a long way. Make a double batch of the kamut (or other whole grain) while you’re cooking it so you’ve got extra for grain bowls, or you can freeze it in handy one-cup portions. I can’t find kamut, can I use another grain? Totally. I prefer a more toothsome grain like wheatberries or farro, but you can definitely use quinoa or go for classic bulgur if you like. Can I make this tabbouleh salad gluten free? Yup. Just use a gluten-free grain like quinoa, wild rice, or brown rice. Do I have to use the chickpeas? Nope. Again, feel free to switch up with another legume such as lentils, or simply leave them out. 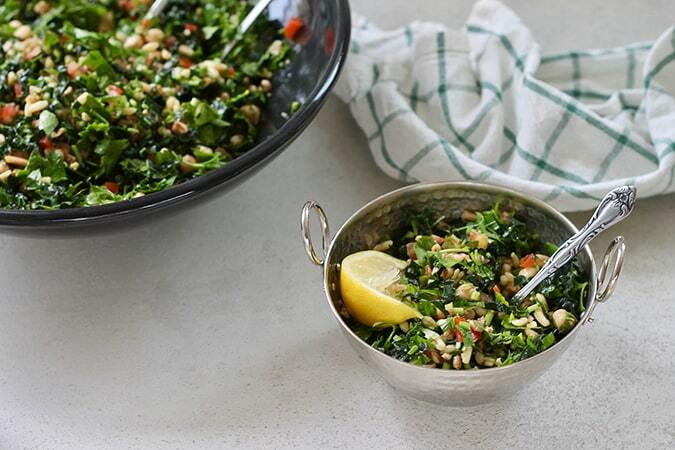 What else can I add to this Kale Tabbouleh Salad to fancy it up? I think this would be pretty good with crumbled feta, cubes of pan-fried halloumi, or topped with soft-boiled eggs. Hey Nutrition Lady, what’s good about this salad? Kale is a nutritional powerhouse! It is extraordinarily rich in micronutrients, dietary fiber, anti-oxidant and anti-inflammatory nutrients, and cancer fighting glucosinolates. Parsley is a biennial plant in the same family as celery with a bright and fresh flavour. Parsley is especially rich in antioxidant flavonoids that can combine with free radicals and help prevent damage to cells. Parsley is also mega rich in vitamin C, and a good source of pre-curser to vitamin A, beta-carotene. The B-vitamin folic acid is also abundantly found in parsley, which is important for our cardiovascular health. Parsley is also an excellent source of vitamin K, and a good source of iron. 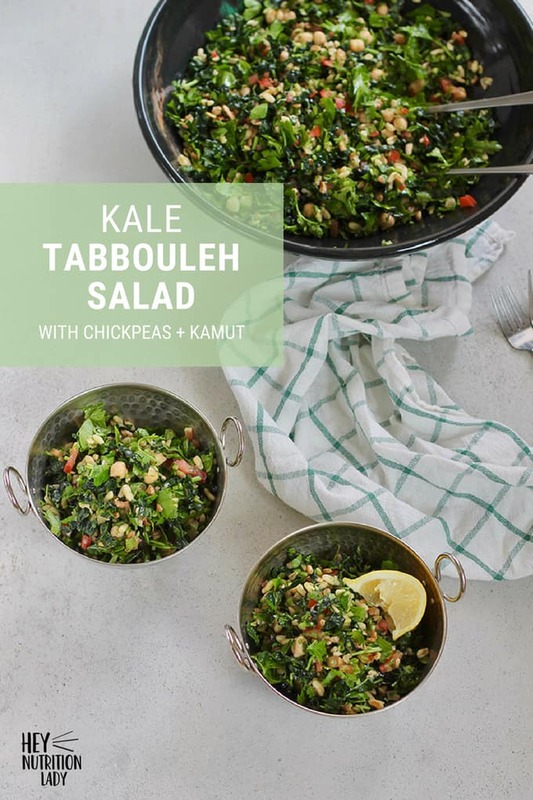 A totally untraditional riff on tabbouleh, plumped up with kale, chickpeas, and kamut for a hearty and filling vegan salad. Start with cooking the kamut. Heat 1 teaspoon olive oil in a medium-small pot over medium-high heat. Add the kamut, and cook, stirring frequently, until it is lightly toasted and smells nutty and fragrant. Add 1 1/2 cups water, and reduce the heat to low. Simmer, covered, until the water has been absorbed and the kamut is tender. Remove from the heat and set aside to cool. Wash the parsley well, and then cut the leaves from the stems. Roughly chop the leaves and place in a large bowl. Finely chop the stems and add those to the bowl as well. Wash the kale well, de-stem, and slice the leaves into fine ribbons. Roughly chop the mint leaves. Add the kale and mint to the bowl as well. Add diced tomatoes, chickpeas, and the cooled kamut to the bowl and toss to combine the salad. Whisk together lemon juice, extra virgin olive oil, salt and pepper, nutmeg, and Dijon mustard. Pour half of the dressing over the salad and toss to dress. Taste, and decide if you want to add the rest of the dressing. Serve the salad, with extra dressing reserved if needed. *If it seems like a lot of dressing, remember that the kamut will soak up a lot of it. If you don't want to add it all, reserve the remainder for when you serve the salad, as you may find that you'll end up needing more. *Serves 4 as a main, 6 as a side. This is such a brilliant idea! 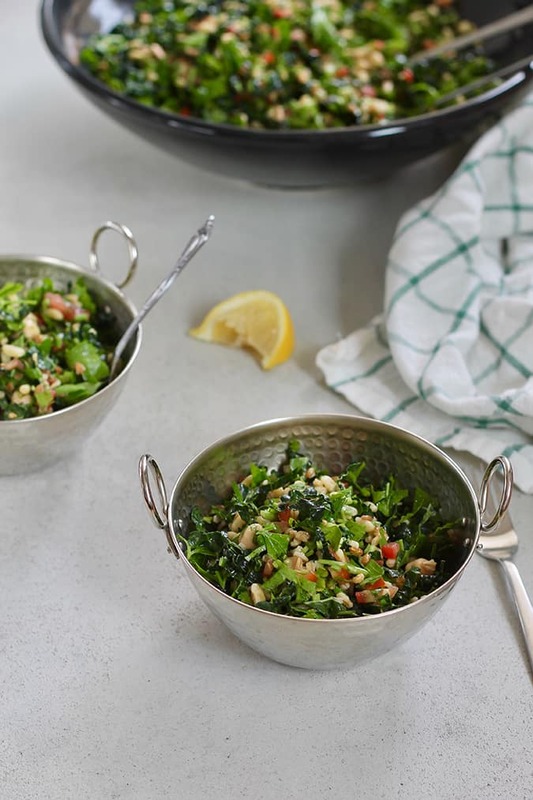 I am usually weary of kale salads because it’s just too much chewiness but in this dish it’s chopped so tiny and mixed in with so many other amazing textures and flavors that it’s just a perfect fit. You’ve got me craving raw kale now, and that is quite a feat! I love tabbouleh and there is a whole mess of kale growing in my garden right now. This is so hearty and delicious and I’m all in with the halloumi!